I don't know for sure, but I think probably not. The variety is a cross of a Fremontodendron native to Mexico and one from California. They require a dry, gritty, pebbly soil that drains extremely rapidly, and they dislike water water. According to what I've read, they develop root rot extremely easily. Please keep in mind, though, that I've never seen a Freemontodendron in person, and this information is just what I've gleaned from books and online. The yellow leaves are only about 10-20% of the whole tree and the rest of the leaves look completely healthy and still dark green. It seems like if there was root rot then the whole tree would be starting to fade. It possibly could be from all the rain this winter. 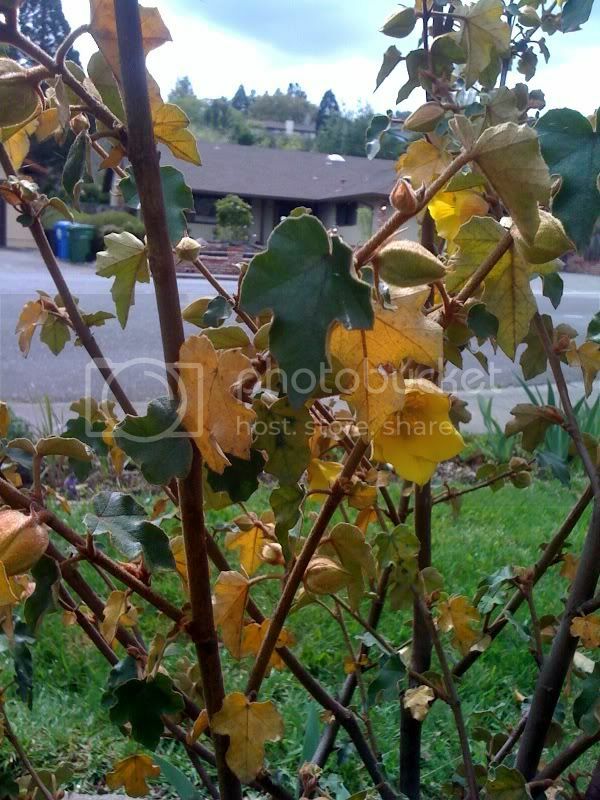 I just hope that the tree isn't dying, and since all the leaves turned yellow I haven't seen any other negative growth. Root rot doesn't affect the entire root ball all at once, striking suddenly and instantly killing the entire plant. Still, I'm not going to insist that I'm out-and-out positive that that's the problem. It's just a possibility that seemed likely in view of the recent weather in your area. It probably has acted that way because of the over-watering, I looked some info about them and it says that after the winter they do not need to be watered at all. If it is root rot, does that mean that the plant is doomed, or if I don't water it may it come back and survive?